Hi everyone! 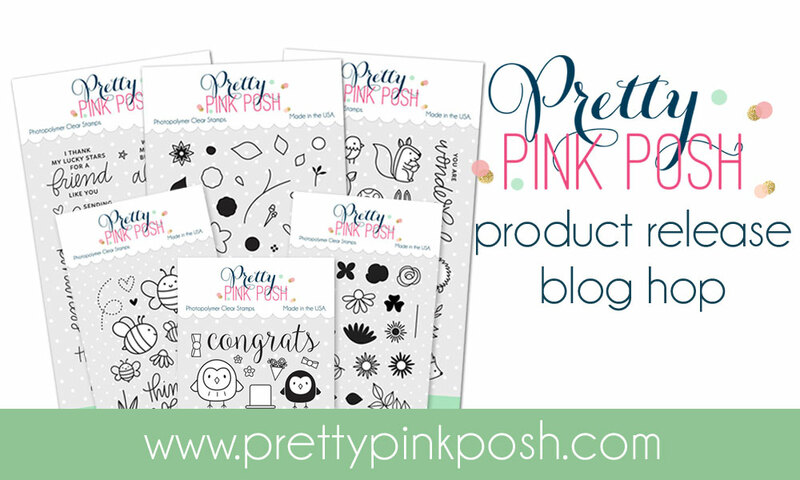 Welcome to the May Product Release Blog Hop hosted by Pretty Pink Posh! I'm so excited to be here along with a ton of other amazing designers for this blog hop! There are 25 different designers over the two days of this blog hop, so make sure you follow along to each of them to see a lot of inspiration! There are four $25 gift certificates to be given away in this blog hop (two per day). So make sure you leave comments on the blog's comments to be entered and they will then be picked randomly and announced on the Pretty Pink Posh blog. Make sure you leave comments by 11:59PM PST time on the 17th May 2017 to be entered into the giveaway! So now onto the hop. The entire blog hop list is down below! Now let's get onto the card I made. I used the new Woodland Critters, Stitched Hexagon Dies and 4mm/6mm Navy Sequins. Along with the previously released Blissful Butterflies and Camping Friends sets. To begin my card today I first went ahead and stamped down all my images from Woodland Critters and coloured them in with Copic Markers. I then used the coordinating dies to cut them all out. Once my images were ready I went ahead and worked on the background. I used the new Stitched Hexagons dies and cut four of them out of some white cardstock to create some windows in my card panel. I then took a piece of watercolour cardstock to place behind the panel and traced around each hexagon onto the watercolour cardstock and then I could ink blend on the background. I took some Distress Inks and coloured each of the traced hexagons on the background, to make them look like a night time scene. I also used some masking tape to cut hills so I could mask over the bottom of each of the hexagons, to colour them green to look like grass. Once everything was ink blended I flicked on some water, picked it up with a cloth and heat set it with a heat tool. I added foam tape all on the back of my white die cut panel and adhered it over top of the ink blended background and then adhered down all my images into each window. I even added butterflies - I don't know if they were the best thing to add into a night scene, but I wanted something to fill the sky - so they are there anyway. Haha! For my sentiment I wanted to use a sentiment from the Woodland Critters set but they wouldn't fit, so I pulled out the Blissful Butterflies stamp set and white heat embossed the hello on some black cardstock and then used the coordinating die to cut it out. I foam mounted that on a banner I had cut from some yellow cardstock and adhered it onto my card. I took a black marker to add some stitched lines onto the side of the banner so it tied in with all the black outlines. To finish up my card I went ahead and added some Navy sequins around my card and also added a moon I coloured with Copic Markers to the top from my card from the Camping Friends stamp set and that completely finished up my card. I hope you enjoyed my card today. If you want to see the video it's linked below. Thanks so much for stopping by today, if you want to be entered into the giveaway make sure to leave a comment and the next stop on the hop is the amazing Virginia Lu! These little Woodland Critters are adorable. I love the nighttime scene you created in the windows. The coloring is wonderful. Thanks for the video. What a great way to use these sweet critters. I love finding new ways to "display" my images. Thanks for the inspiration. Love your card and the video is fabulous! What a creative way to use several darling images. Your coloring is awesome. Thanks so much for the video. The bear, bird and squirrel are my favorite images. They are just so sweet looking. Your cards are beautiful. Oh Eloise, you've done it again! Your scenes are just precious! Wow, absolutely gorgeous! Your coloring is amazing. And this card is soooo adorable. Very adorable card!!! Love those Hexagon dies!! Cute card....I just love this stamp set. Awesome coloring on your darling card! Love the fun hex windows! Cool way to use these hexagon dies and create starry night windows. Oh gosh! I love the frames and the critters! So fun and creative! Thanks for the inspiration! Very cute with woodland critters and hexagons. OMG so cute.💙 thanks for the video. Have to get some of these dies. Love the hexagon shapes, they add such a nice touch. I love the Woodland Critters and your card design! Love how you have used the hexagon die with these darling stamps. Your card is so cute! Those little Woodland Critters are adorable! Very fun card design! Your night sky is beautiful! Absolute love the adorable little woodland critters!!! What a cool card design. I love how you incorporated all the adorable Woodland Critters in your design. Love the background you created, it sets the images off perfectly. Now I am off to check out your process video! Wow, love the card, especially the hexagons. Really neat. Many thanks for your wonderful inspiration. Wow, great card. So detailed and beautiful. Soooo cute! I love the 'windows'. I like the window theme of your card...it's so pretty! This card is so adorable! Love the new release! I love your darling woodland creatures! This is a beautiful card! Clever use of several different stamp sets and gorgeous coloring! Adorable card. I love it so much. Love the window effect and your wonderful night skies. Nicely done. The critters are so cute! I have seen so many different cards using them. It is amazing how versatile they are! Love the night scene. Very cute card. Very original card design, love it! Thank you for this lovely card. It's a great inspiration for me. Your idea of the little "windows" is excellent. Really adorable card. In fact I love this entire release for sheer cuteness! The woodlawn critters are such a great addition and your card showcasing them with the Hexagon stitched dies is perfection!! Great card and love the deep blue sky as well! I love your card. Great video and love the idea die cutting openings and blending backgrounds then adhering die piece. The cute darling images are place beautifully. So creative and great color choices. Love the night sky background - and the critters, of course! The Woodlawn animas are so cute, I really like the scenes. Wow - I love how you used the hexigon dies with all of the other stamped images! great card. Awwww...... Those are such cute animals! I love how it looks like they are sitting inside the hexagons, like they are on a shelf. Great job and great coloring. I hope I win something! Beautiful card, and lovely video!! Great card!! You've used the hexagon dies and the critter stamps so well together!! Every element is wonderful! The hexagon cutouts are really cute and so are all the critters! These are such adorable little critters! Very sweet card! I love Copics for coloring. Oh Em GEE - cutest card ever!! 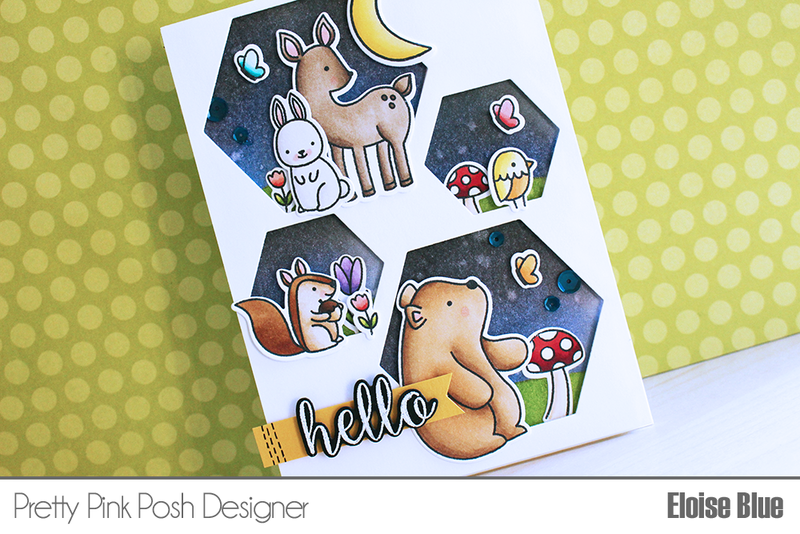 Love the way you created a scene using those adorable critters and the hexagon dies!! Wonderful!! Adorable card, beautifully colored!! Love this release and blog hop! Cute card. Love the woodland critters. What an awesome card! Love the scenes! How creative! The hexagons are great!